It is a breezy, sunny Sunday afternoon, and we’ve decided to finally make good on a promise to Patti Wilson, one of our favourite Locals Restaurant waitresses. She is a vibrant woman whose short, wildly cool haircut, funky glasses and sense of humour radiate energy, creativity, fun and kindness. 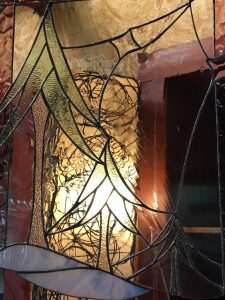 It shouldn’t have been a surprise when I learned that several of the beautiful stained-glass panels and all the candle holders in Locals are her creations. Numerous times, after finishing the delicious meal she served us, we made promises to visit her studio just outside Courtenay, that until today, went unfulfilled. A trip to Patti’s studio is a short drive out of town. 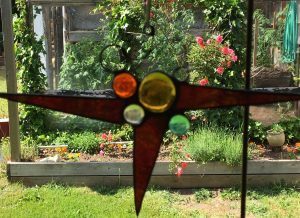 It’s worth going there just to see her welcoming home, social gardens, green house with tree-size tomato plants and log-hewn planter boxes. Anyway, back to the studio: a closed in porch off the barn-garage, a space overflowing with comfort. Victorian-esque furniture and colors, wood stove, twinkle lights and twirling scenes of color and design invite you into a world that is cozy, festive and happy! Stepping into this room of eye candy is delicious. It takes several scans before I can focus in on the beautiful scenes and creatures that are her unique creations. 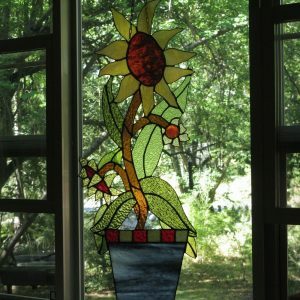 Patti will tell you her stained-glass work is a hobby, but I assure you, her work is no amateur pastime. It is a unique and refined reflection of her life spent with partner Brian on the West Coast of our island, in thick forests and on grassy knolls, in buzzing Seattle and places in between. 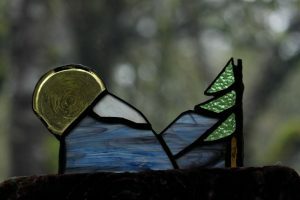 My dream is to adorn our home with one of her bigger panels that depict mountains and a stylized cedar. However, on this visit, I settle for a rectangular votive holder that revealed a similar landscape, on a much smaller scale…with the moon breaking the edge. 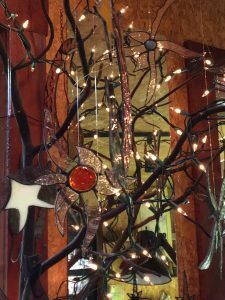 I also walked out with birds and oblong stars – all in the $30- $40 range —gifts chosen with much deliberation, I might add. 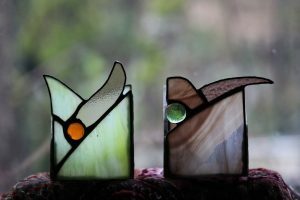 What I really love is seeing how these stained-glass pieces pick up the background outside the windows in which they are hung. The creations change with the seasons, the day’s weather, evening shadows and yellow rays of daybreak. Their beauty is enough to break my heart, in a good way. I highly recommend choosing your selection from her studio, though items can be purchased on her website. The experience of being with Patti in her element adds a dimension to this art which makes your purchases that much sweeter. 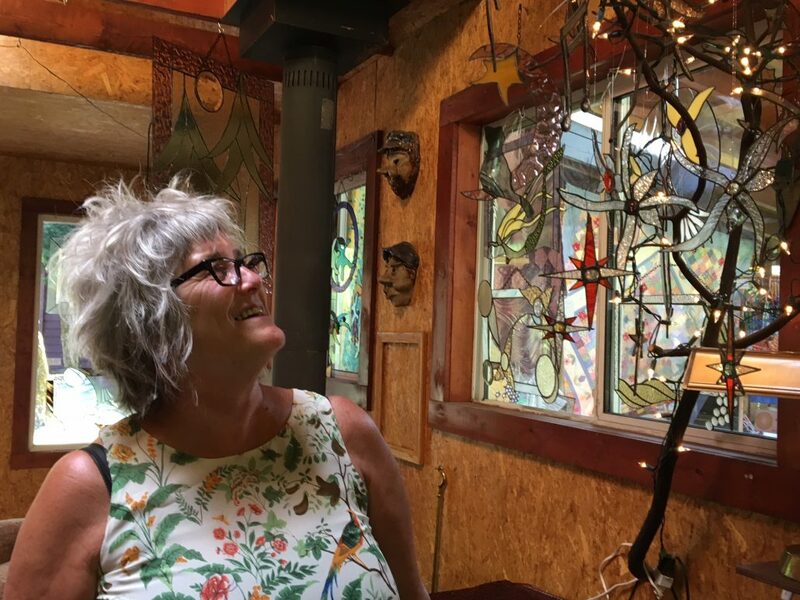 On my way out, Patti points out upright shelves of glass filled with panes of glass just waiting to be granted a new life as an adored art object. Before I leave, I already want to return and settle into one of her big chairs with a glass of red wine (which she loves too) and just be among the collection of reflections of places and times and creatures, some of which have tendrils stretching back into my own past on the island. If Brian is around, you’ll find he figures so nicely into your experience as does Ollie, their “getting-up-there-in-age” adorable little pup who tolerated ours. 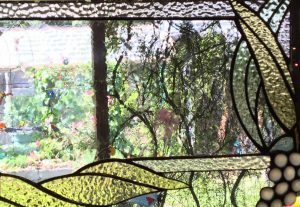 Is it no coincidence then that Patti is a reflection of her stained glass, and an explanation of why they are both beautiful? You can call her to make an appointment or find her online here.